Don’t Miss The Norfolk Motorhome Show! The Norfolk Motorhome Show is back for it’s fourth year! Located in one of the UK’s most popular holiday destinations, you can’t fail to fall in love with Norfolk. This charming county gives showgoers the chance to holiday on the edge of a beautiful city whilst being close enough to some of the areas stunning coastlines. 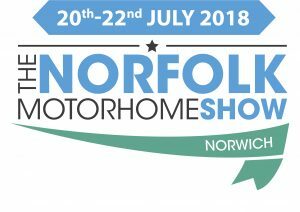 Now in it’s fourth year, The Norfolk Motorhome Show offers you a great value four night break or the opportunity to visit the show for a days shopping in the exhibition area. If you’re looking to buy a new motorhome or campervan, there will be over 200 new and used models on display from over 15 of the country’s leading dealers, including Auto-Sleeper dealer Simpsons Motorhomes. Make the most of knowledge from the industry experts all in one place to ensure you get the most from your exciting purchase. Once you’ve got yourself a vehicle, you’ll then need to kit yourself out with accessories, everything from pots and pans to solar panels and outdoor furniture can be found at the show, so it really is your one-stop-motorhome-shop. There will be free parking at the show and day tickets are only £6 for adults which can be bought on the gate on arrival. Under 16’s go free and dogs kept on their leads are most welcome! For more information about the show CLICK HERE!